Saving for retirement is critically important — we all know that. But sometimes, the confusing details can throw us off course or prevent us from doing all we can to properly grow our nest egg. Education is the best tool when it comes to most matters of personal finance. And for retirement planning, there are some facts everyone should know. 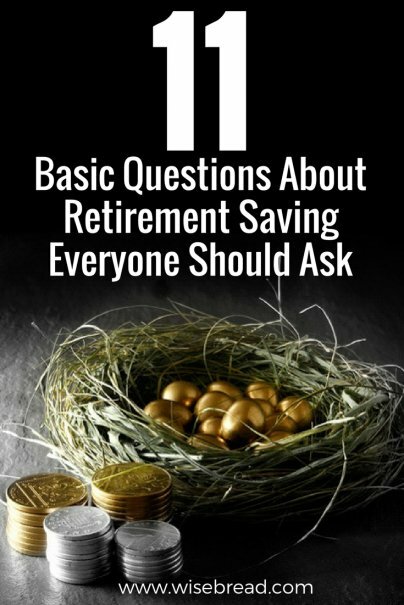 It's time to ask yourself these questions and brush up on the basics of retirement savings. 1. When can I start contributing to a retirement account? 2. How much can I save in each type of account? 3. Am I taking advantage of the company match? If you're offered a company match, you must take advantage of it. And since 94 percent of Vanguard 401(k) plans provide employer contributions, chances are that you have access to a workplace savings plan with a matching formula. 4. What happens if I change jobs? From the date that you separate from your employer, you should aim to decide what to do with your 401(k) balance within 60 days. The reason for 60 days is that this is the deadline to complete an indirect rollover into a new retirement account (if your employer were to cash out your entire balance and hand you a check) and pay back any outstanding loans on your 401(k) (if not paid, they become taxable income and may even trigger penalties). Rollover account into a new or existing IRA. Rollover account into a new or existing qualified plan. Request a full cash-out of your account. Do a mix of the above five options. 5. Is it better to contribute after-tax or pretax dollars? There is no right or wrong answer here, as either way offers a benefit. Contributing with pretax dollars (traditional IRA, 401(k)) allows you to reduce your taxable income by deferring income taxes until retirement, at which point you're more likely to be in a lower tax bracket. So, if you're expecting to be making more money now than you will be in retirement, you should contribute pretax money. This is the majority of American workers. Workers just beginning their careers, workers in professions with a high upside income potential, and individuals expecting a large windfall, such as a family trust or inheritance, can greatly benefit from contributing after-tax dollars to a Roth IRA or Roth 401(k). 6. Can I withdraw money early from my accounts? Early distribution rules vary per type of plan. Generally, you can only take money from a 401(k) plan early due to a hardship or extreme situation, such as avoiding a foreclosure, making a first-time home purchase, or an unexpected medical expense. However, rules vary per plan: Some plans may only offer you the option to take out a loan, while other plans won't allow you to withdraw money early at all. If you take a distribution from a 401(k) before age 59 ½, you become liable for applicable income taxes and penalties. Early withdrawals on contributions from a Roth IRA can be made at any time without incurring taxes and penalties, since you have already paid taxes on the money. Withdrawing any amount that exceeds your contributions counts as earnings, and is therefore subject to tax and penalties. In order to avoid those taxes and penalties, your Roth IRA must be at least five years old and withdrawals must be used for a qualified expense, such as the purchase of a new home or a disability. Higher education costs are also exempt from penalties, but you must pay income tax on the withdrawals. 7. What are required minimum distributions? Eventually, the IRS wants its money in the form of taxes on your retirement distributions. When you reach age 70 ½, you must begin taking required minimum distributions (RMDs) from your retirement plans. These rules apply to traditional and Roth 401(k) plans, as well as 403(b) plans, 457(b) plans, and traditional IRA-based plans such as SEPs, SARSEPs, and SIMPLE IRAs. If you fail to take your RMD, the IRS will take 50 percent of the amount you should have withdrawn as a penalty. 8. Are there any tax credits for retirement contributions? 9. What is the recommended 401(k) portfolio allocation? 10. What is an HSA? Those with a high deductible health plan (HDHP) are eligible for a health savings account (HSA), which is a way to make pretax contributions to save for medical expenses. Many HSA providers offer the option to put money in an investment account with several fund options, including mutual funds and low-cost index funds. 11. Does my plan offer financial advice services? More and more plans are jumping on the bandwagon of offering a robo-adviser (an automated service suggesting or performing certain types of transactions on your behalf). The range of trades that a robo-adviser can perform ranges from periodically rebalancing your portfolio to selling securities.